While I appreciate Dr. Stupples’ article and his intention to highlight our non-existent counter to adversarial Information Warfare, he made far too many errors in what appears to be a new subject for him: Information Warfare at the national level. I wrote a response in the comment section in the original article, but it would take pages and pages and pages to properly address my thoughts. He mentions Russia and China… when I saw China mentioned, I knew he was thinking of cyber and electronic warfare. Living and working in the UK, I am certain Dr. Stupples knows about Information Warfare and Psyop waged against Russia, and the UK has a much more whole-of-government approach than does the US. Beyond Cyber, EW and Psyop, I am afraid I must regretfully judge him lacking in knowledge of the greater field of information warfare. We further complicate matters by not having a recognized name for IW, in the West, at the national level. In the US we were forced to change the name from Information Warfare to Information Operations because some people at the US Department of State simply said “We don’t do warfare”. This article will haunt me, I am certain, for days. Not for what it said, but for what it did not say. 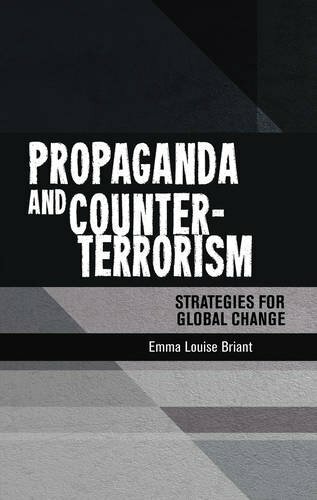 To get more of an idea, please read “Propaganda and Counter-Terrorism” by Dr. Emma Briant. Twice. Her book is the definitive book for IW (or whatever the heck you want to call it) organizations in both the UK and the US. …and it still falls short of everything in the discipline. One last thought. It was very nice to see the late Dan Kuehl’s name mentioned at the beginning of the article. My wonderful friend, mentor and sometimes father figure, Dr. Dan Kuehl, his efforts continue and always will. Western leaders are investing billions to develop capabilities matching those of China and Russia, establishing military commands for attacking, defending and exploiting the vulnerabilities of electronic communications networks. 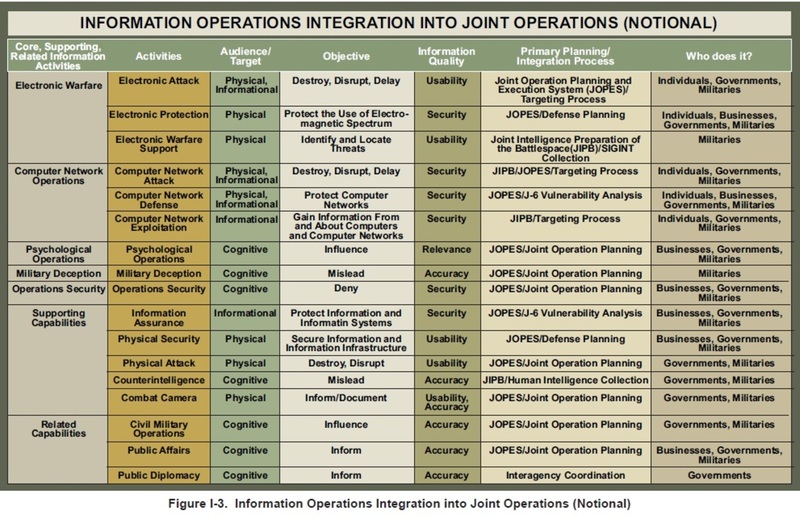 Information warfare combines electronic warfare, cyberwarfare and psy-ops (psychological operations) into a single fighting organisation, and this will be central to all warfare in the future. Electronic warfare is used to disrupt or neutralise these electromagnetic transmissions. These might be electronic counter measures and jammingused to cripple military communications or weapons guidance systems. Or it can include civil uses, for example the ADS-B air traffic control system used by aircraft to avoid in-flight collisions, or the recently adopted European Rail Traffic Management System (ERTMS) that replaces railway trackside signalling and provides full control of trains. Jamming or degrading either of these would cause chaos. We have become familiar with cyber-attacks launched through the internet against digital networks, which can make it impossible for businesses to operate. Enormous damage can follow, in cost and reputation, as seen from attacks on Sony Pictures and TalkTalk. Bringing down a stock exchange could cause massive financial losses. Cyber-attacks can also be directed at industrial control systems used in manufacturing plants or in power, water and gas utilities. With the capacity to affect such a wide range of national infrastructure lives would be put at risk. Psy-ops are aimed more at degrading the morale and well-being of a nation’s citizens. This might include spreading false information, rumour and fear through social media and news outlets. The great level of connectedness that populations have today is a strength, but being instantly connected means that misinformation and fear can also spread rapidly, resulting in panic. Information warfare, then, is the integration of electronic warfare, cyberwarfare and psychological operations, for both attack and defence. It’s suspected that Russia has launched increasingly sophisticated non-lethal attacks on its neighbours, for example against Estonia, Georgia andUkraine, which experienced an integrated onslaught of electronic, cyber-attacks and psychological operations. There is convincing circumstantial evidence that the Baku-Tbilisi-Ceyhan gas pipeline in Georgia was targeted using a sophisticated computer virus which caused an uncontrolled pressure build-up that led to an explosion. Even the so-called Islamic State has shown it has a good understanding of how to use and manipulate social media for use in psychological warfare. IS is reportedly building greater cyberwar and electronic warfare capabilities, as it recognises that winning the information war is key. The US director of intelligence has emphasised the enormity of the cyber-threat facing the US, while British General Sir Nicholas Houghton in a speech at Chatham House observed that most acts of physical war today incorporate an online aspect, where social networks are exploited to manipulate opinion and perception. He also acknowledged that the tactics employed by Russia combine aspects of information war and also counter-intelligence, espionage, economic warfare and the sponsoring of proxies. We need to better understand the full scope of information warfare as it evolves, identify where we are most vulnerable, and then establish a single point of responsibility to implement defence mechanisms. Because those adversaries that are unconstrained by western policies, or by ethical or legal codes, can and will exploit our vulnerabilities. Previous Post Russia, do you monitor the Guard Frequency, and how? what i see. The practice of mind space possession is the future warfare. Few nations have used these tools but tools were based on experience and not knowledge based. The possession of an individual mindset or whole nation is a process inwhich the mindset is controlled by a third party to achieve some goals. In future, if this knowledge expands. it will be a disaster becausw how to induct the mindset and possess in such a way. that victims cannot even feel they are possesed.